Fresque au Club olympique de Adhamiya à Bagdad. Photo Caecilila Pieri 2011, tous droits réservés. The Baghdad Olympic Club is located on Antar Square at the entrance of the Adhamiya neighbourhood. 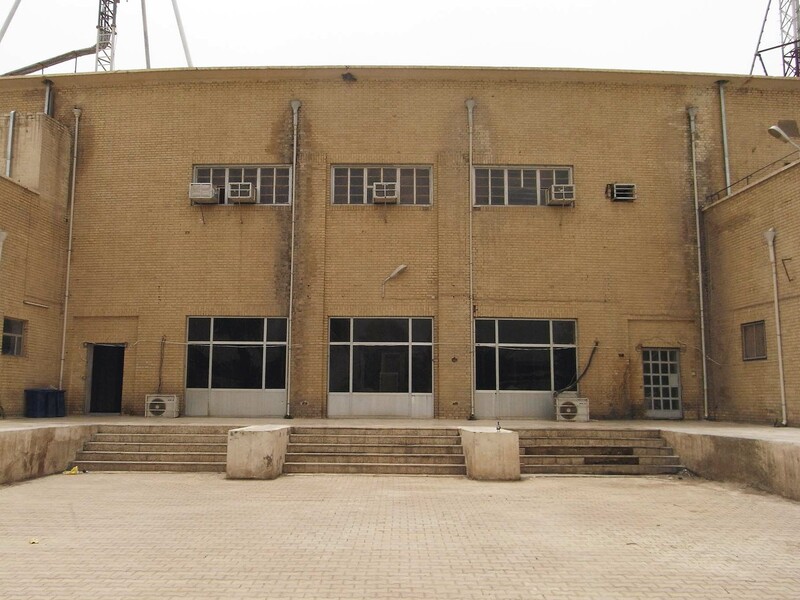 It is both the first modern sports complex built in Iraq and one of the first public programs designed under the supervision of the architect Ahmad Mukhtar Ibrahim. Mukhtar was the first Iraqi architect graduated from Europe, and the first Iraqi to be appointed as Government Architect whereas this position had steadily been occupied by British architects since 1920, the year the British Mandate was established over Iraq. The Baghdad Olympic Club represents one of the key symbols of a modern and independent Iraq. It is currently being damaged by a restructuring project. Yet it would be important not only to preserve it but also to restore it to its original condition. Around 1935, Iraq was the theatre of numerous reforms and an unprecedented urban development. Cultural institutions underwent a complete reorganisation, testimony to a new administrative emancipation from the former British tutelage. In 1934, for the first time since the position had been created by Gertrude Bell in 1920, the Directorate of Antiquities was entrusted to an Arab: Sâti’ al-Husrî. Educated in Istanbul then in France, this civil servant was an activist, supporting the role of school and education as catalysts for social progress and take over from family education. He was also appointed Minister of Public Instruction in 1935. In 1936, the first modern law on the administration of archaeological excavations was enacted. Above all, the year 1936 was in several ways a major turning point in local elites training. The builders corporation, who used to be represented by ustâs trained on the job – as had been the practice since the Ottoman period – was professionalised as of 1936 when Iraqi students who graduated abroad began to come back, the first of them being Ahmad Mukhtar Ibrahim. 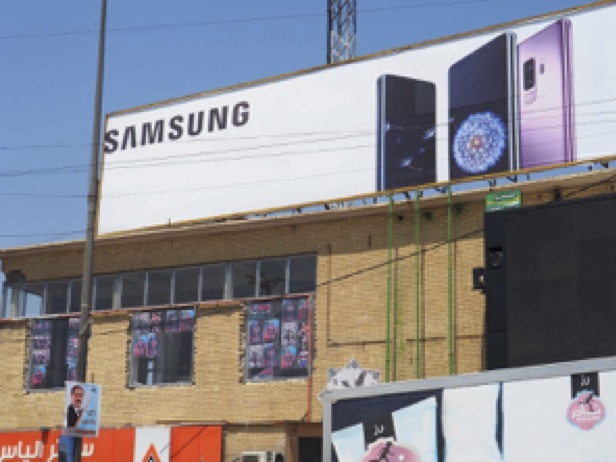 From then on, this new generation of professionals were officially tasked with building a country where 360,000 inhabitants already lived in the inner-city of Baghdad, the capital. Out of ten Iraqi architects who studied abroad, Ahmad Mukhtar Ibrahim (1907-1960) was the first of five peers to graduate from Liverpool. A year later, he became the first Iraqi to be appointed as Government Architect, a position which had been filled by British architects for the previous fifteen years. In the UK, the Architecture curriculum at Liverpool was the first to distance itself from the British tradition of Arts and Crafts, thus paving the way for the emergence of modern city builders who used a combination of architecture and urbanism. From 1905, under the influence of Charles Reilly, teaching at Liverpool adopted a ‘universalist’ outlook modelled after the French Ecole des Beaux-Arts. It emphasised the importance of a modern professionalisation of the architect’s role – different from the builder’s – and on a rationalist conception of the project with simple geometric volumes and axial symmetries. 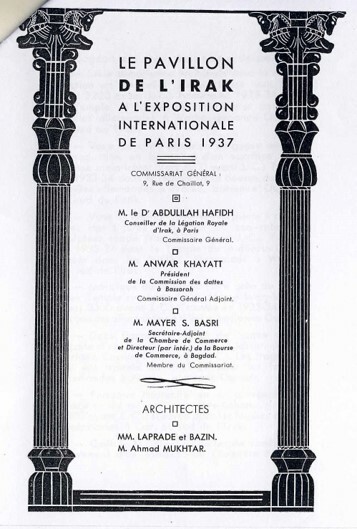 Mukhtar was the advising-architect of the Iraqi Pavilion at the International Arts and Techniques Exhibition in Paris, from May to October 1937. 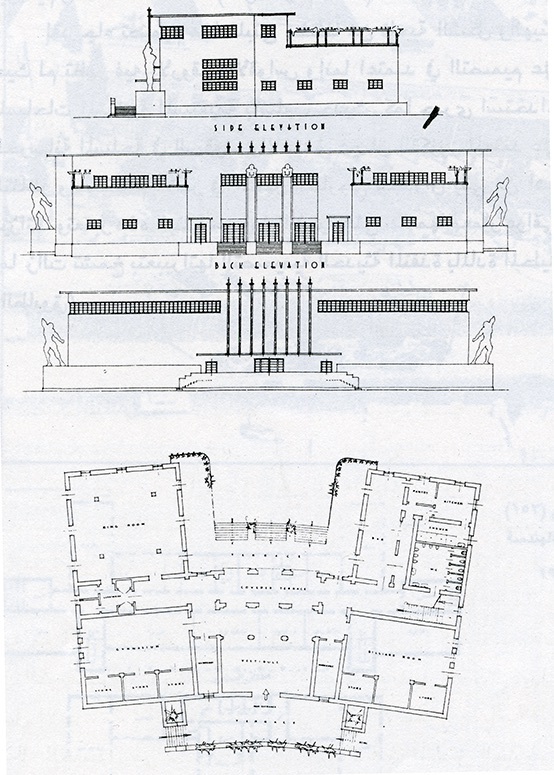 In the related file kept at the French National Archives in Paris, it is recorded that, alongside French architects André Laprade and Léon Bazin, Ahmad Mukhtâr participated in this project, and his name actually appears on the official guidebook of the Iraqi Pavilion. Soon after his return from Great Britain, he was appointed as the Iraqi Government Architect between October 1936 and September 1937, date of the Exhibition’s inauguration (ill. 1). 1. Official brochure of the Iraqi Pavilion at the 1937 International Exhibition in Paris. The cover mentions the name of Ahmad Mukhtâr next to the French architects Albert Laprade and Léon Bazin. French National Archives, Paris, AN/ F12365. At the end of 1936, as soon as Iraqis officially announced that their country would be present in Paris alongside the great world powers, the Iraqi press underlined the symbolic dimension of the event: “Our renascent country is well in need of a large scale external propaganda because the ignorance of the West regarding Iraq is almost complete. The point is to make our national sovereignty known to distant countries” (Al-Bilad, 27/11/1936). We can also read in the special edition of L’Illustration dedicated to the exhibition in 1937: “In the elegant Iraqi Pavilion, the young state exhibits the results of twenty years of efforts in social organisation and industrial arrangements.” This international exhibition represented a new stage in the representation and construction of Iraq’s international image, and Ahmad Mukhtar was entrusted by his country to embody this responsibility at an international level. 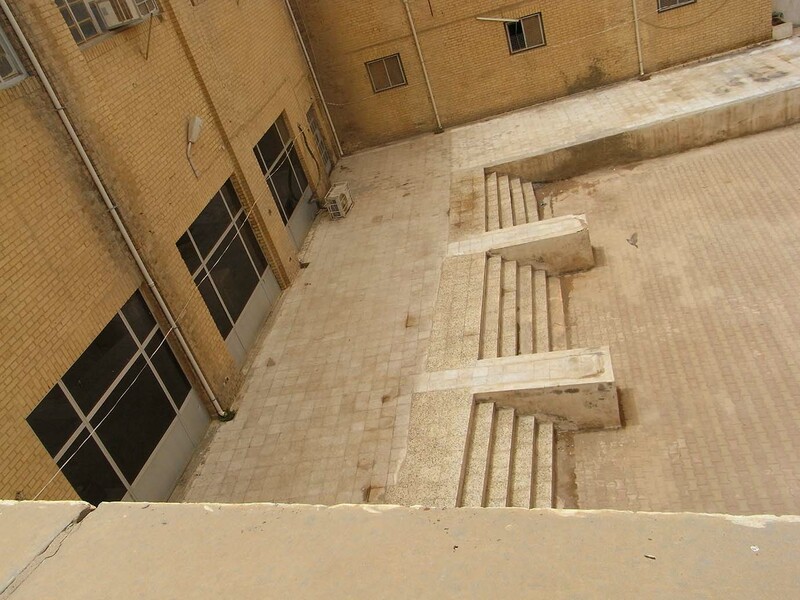 With the Olympic Club, the Ministry of Youth and Sports inaugurated a new governmental line for public buildings constructed under the supervision of Iraqi architects who had returned home. This particular building reflects a stylistic break from the public architecture of the British Mandate period. It displays an interesting synthesis between European models and adaptation to the local context, particularly through the use of brick and by taking into account climatic conditions. Its curved main façade constitutes an urban element of its own right and is intimately linked to the design of Antar Square (ill. 2). Furthermore, the simplicity of the elegant front and rear façades draws on the “less is more” concept theorised by Mies van der Rohe when teaching at the Bauhaus (ill. 3). 2. 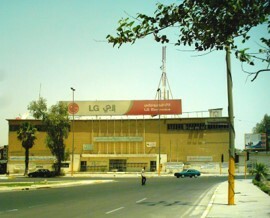 Main facade on Antar Square; picture from a file of Baghdad University students, A. al-Tâ’i, M. Mahmûd, H. Hadhûn, H. Qaddû, 2005, all rights reserved. The curved main façade is constitutive of the whole urban project. 3. Rear façade, Picture Caecilia Pieri, 2011, all rights reserved. A functional simplicity in the spirit of the Bauhaus highlighted by the use of Iraqi bricks. The monumental interior volumes, punctuated by pillars with thin mouldings, and the flight of stairs showing a counter-curve on the rear façade are typically Art déco (ill. 4, 5, 6 and 8). Finally, stylised cusps subtly echo Mesopotamian architecture (ill. 7). 4. Typically Art déco volumes, proportions and pillars with mouldings. In the background, Faiq Hassan’s panel, dated 1972, Picture, Caecilia Pieri, 2011, all rights reserved. 5. Typically Art déco volumes, proportions and pillars with mouldings. In the background, Faiq Hassan’s panel, dated 1972, Picture Caecilia Pieri, 2011, all rights reserved. 6. 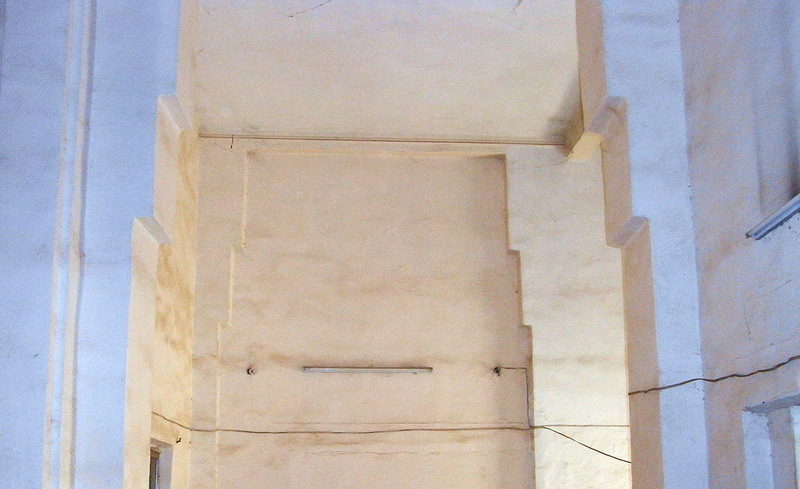 Left: Geometry and counter-curves of the flight of stairs at the back of the building. Right: Stylised cusps discretely recall features of Mesopotamian architecture. Picture Caecilia Pieri, 2011, all rights reserved. 7. Left: Geometry and counter-curves of the flight of stairs at the back of the building. Right: Stylised cusps discretely recall features of Mesopotamian architecture. Picture Caecilia Pieri, 2011, all rights reserved. 8. Plan of the ground floor and elevations. Source: Shirzad. To conclude, the Olympic Club can be said to symbolize the moment when the Mandate authorities handed over the instruments of cultural policy to the local elites, that is to say a significant turning point in the history of modern Iraq. 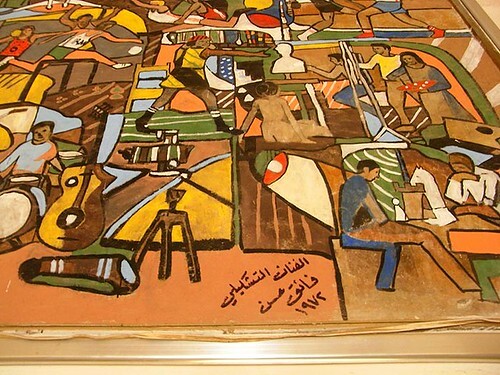 It is contemporary to the foundation, in 1939, of the Institute of Fine Arts by a group of artists educated in Paris, particularly the painter Faiq Hassan, and the sculptor and painter Jawâd Salîm. 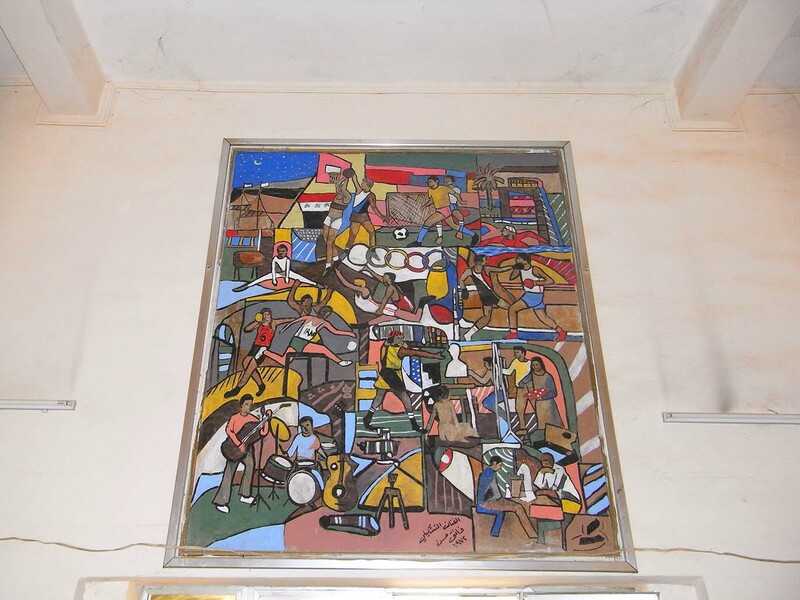 This is the reason why, in 1972, the Ministry of Sports and Youth commissioned Hassan to execute a large painting depicting popular unity through sports, games and arts. Today, this panel still stands at the center of the entrance hall. The Olympic Club thus has the privilege of being the custodian of one of the few pieces by the master still in place (together with the Peace Mosaic on Tayyaran Square) (ill. 9). 9. Detail of the Faiq Hassan panel dated from 1972. The painter was asked to represent popular unity through games, arts and sports. Picture Caecilia Pieri, 2011, all rights reserved. In 1939, public architecture in Iraq was starting to be used as a vehicle for national assertiveness. In that sense, just like archaeology, it revealed « a paradigmatic nationalism, aiming for national homogeneity and a common denominator » (Bernhardsson 2005). The era of traditional construction – empirical, hand-made and characterized by an eclectic production – was coming to an end. 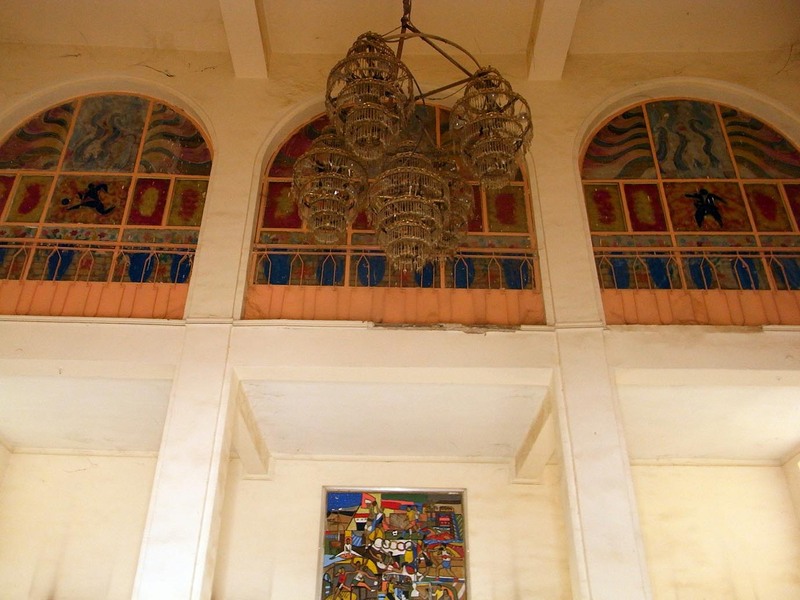 The Baghdad Olympic Club was a pioneering feature of a new policy that sought to answer the needs of a young and developing society, and the challenges facing a newly independent country. With vast unbuilt plots at its back, it was predictable that the building would, sooner or later, be redeveloped. Currently, the façade is damaged by openings, advertisement panels and a screen (ill. 10). Yet the historic building has the capacity to be incorporated in an extension project without losing its original features and harmonious integration in the surrounding urban context. 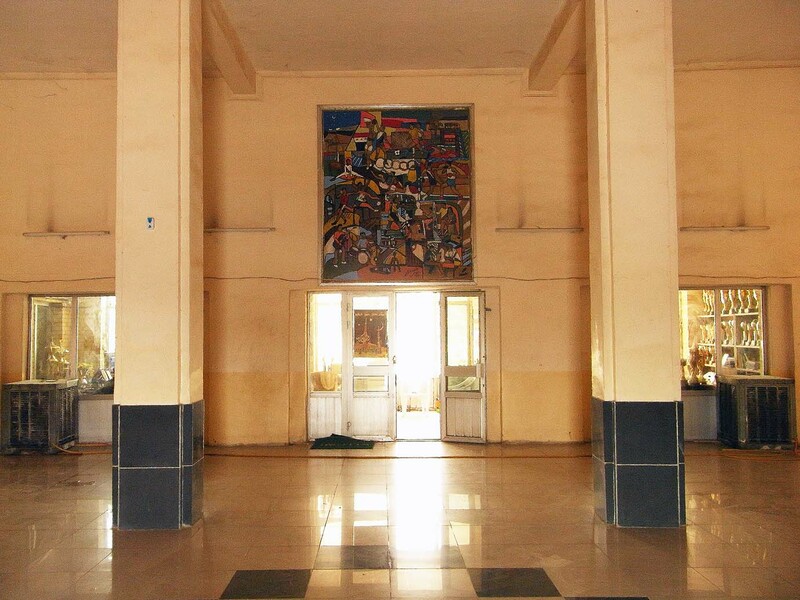 Let’s hope that the intervention planned by the Ministry of Youth and Sports does not miss the opportunity to rehabilitate this iconic building in line with its outstanding original design. 10. Detail of the façade, currently damaged by new openings, advertizing panels and a huge screen. Picture Caecilia Pieri, 14 April 2018, all rights reserved. Caecilia Pieri, with the collaboration of Ghada Razzuqi. al-Ashab, Khâlis, 1974: Urban Geography of Baghdad, PhD thesis, Newcastle upon Tyne, 1974. Bernhardsson, Magnus T., 2005: Reclaiming a Plundered Past. Archaeology and Nation-Building in Modern Iraq, Austin, University of Texas Press. Crinson, Mark, 2003: Modern Architecture and the End of Empire, Dorchester, Ashgate. Dupont, Anne-Laure & Mayer-Jaouen, Catherine (eds. ),2002 : Débats intellectuels au Moyen-Orient dans l’entre-deux-guerres, Revue des mondes musulmans et de la Méditerranées, série Histoire, no 95 -98, Aix-en-Provence, Édisud. Pieri, Caecilia, 2015 : Bagdad, 1914-1960. La Construction d’une capitale moderne, Beyrouth, Presses de l’Ifpo. Salîm, Nizâr 1977 : L’Art contemporain en Iraq, 1977, Lausanne. Dr. Caecilia Pieri is Associated Researcher at Ifpo, the French Institute of the Near-East, and a UNESCO/World Heritage expert on modern heritage in the Arab world. She is the author and co-author of several volumes on Baghdad: Baghdad Arts déco, 1920-1950 (published in Arabic as Baghdad, al-turath wa-l imara al-haditha 1920-1950 with Al-Mada, 2009 and in English as Baghdad Arts déco, Architectural Brickwork 1920-1950, American University of Cairo Press, 2011); The Le Corbusier Gymnasium in Baghdad, Éditions du patrimoine, Paris, 2014 (also available in Arabic); Bagdad 1914-1960, La construction d’une capitale moderne, Presses de l’Ifpo, 2015. Dr. Ghada Razzuqi al-Slik, is Professor of Architecture, University of Baghdad, and Chair of the DOCOMOMO-Iraq chapter. She is the author of Baghdad, City of Stories, 2011. Translation from French into English: Esther Spitz, B.A. SOAS-London.